First, it was selfie sticks; then, it was hover boards. But the most recent phenomenon to sweep the nation is caffeinated peanut butter. The peanut butter itself is not much different than other brands out there. Per two-tablespoon serving, it contains 210 calories, 18 grams of fat, 8 grams of carbohydrates, 2 grams of sugar and 8 grams of protein. What sets it apart, however, is the 150 milligrams of caffeine that comes in every serving–the equivalent of two cups of black coffee. Being such a highly concentrated amount of caffeine combined with a very popular go-to snack, many have voiced concern over the dangers of consuming so much caffeine. New York Senator Charles Schumer has called for an investigation by the Food and Drug Administration to examine whether or not the new caffeinated peanut butter is safe and should be made available to the public. Consuming high amounts of caffeine has been proven to lead to increased heart rate and blood pressure, as well as being even fatal in an overdose. I had the opportunity to check out the peanut butter for myself and order a jar. As someone who greatly enjoys snacking on peanut butter as well as sipping on a strong cup of black coffee, I was interested to see how well a job the company had managed to do at fusing the two. The first thing I noticed when I opened the packaging was how small the jar was. It’s a little larger than a bottle for medicine. It’s quite small compared to the average jar of peanut butter off the shelf at Wal-Mart. The jar is 8 oz, which breaks down to 8 servings. At $6 plus shipping per bottle, those are some expensive servings. Opening the bottle, a strong smell best described–not surprisingly-as a mixture of coffee grounds sprinkled on peanut butter arrests your nostrils. The peanut butter itself looks and feels no difference than any other ‘creamy’ style peanut butter. There are no large chunks of coffee beans or sharp grounds. Even the taste of the peanut butter is not much different than other popular brands, yet it’s the strong organic aftertaste that gives it away. The coffee-like taste kicks in at the end, tasting strong, and to some, even bitter. All in all, the peanut butter tasted great and true to its claim, gave me the extra boost of caffeinated energy I needed late at night. However, I do not think I would recommend it to others. While there is nothing actually wrong with it, it is costly and dangerous to eat in large quantities. 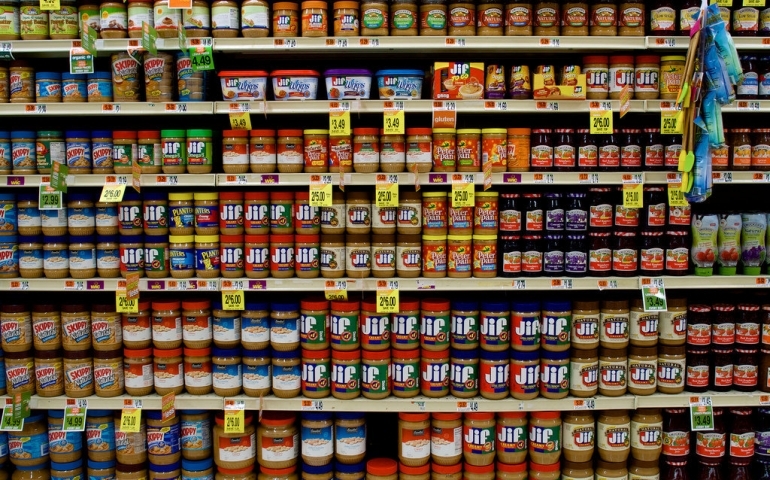 If you want peanut butter, stick to binge-eating a large jar of crunchy Jiff from your local Wal-Mart. If you’re looking for a caffeinated pick-me-up, grab a steaming handcrafted brew from your local coffee shop. For more information about STEEM peanut butter, go to http://steempb.com/. Next PostParking Issues: What’s the Deal?